It’s pizza night! I had been experimenting with putting all different kinds of vegetables into our pizza sauce. Though, after several months of doing so, I think the children missed the basic pizza sauce. Tonight I tried to make a minimal veggie sauce. I picked some tomatoes, peppers, and basil from the garden and prepared them for the sauce. I use the Blendtec to make the sauce; each ingredient listed I just throw in there and then puree it on the Sauce/Dips setting. Blend well. Pour into a saucepan, and let simmer for about 20 minutes or longer for reduction. Add 1 4oz jar of organic tomato paste. Stir well. Add pepper or salt to taste. Pour onto fresh homemade pizza crusts, top with good cheeses, – we like cheddar, asiago, colby and a homemade farmer’s cheese. .Add your favorite toppings, bake for about 10-15 minutes. Enjoy with a green salad. 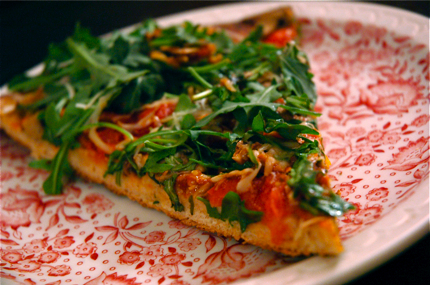 Sounds really delicious – I adore a good home made pizza.